Both Brent and WTI futures are trading at their lowest levels since 2008 and previous weeks have offered some spectacular declines, if there is such a thing as that! Biggest of the declines were noted when Brent fell by 12.65% and WTI by 11.90% between Friday, December 4th and Friday, December 11th using 2130 GMT as the cut-off point for 5-day week-on-week assessment. Following that, like January, we had another spread inversion in favour of the WTI, with the US benchmark trading at a premium to global proxy Brent for a good few sessions before slipping lower, as both again got dragged lower in lacklustre post-Christmas trading. It all points to the year ending just as it began - with a market rout, as yours truly explained in some detail via a recent Forbes post. With nearly 3 million barrels per day of surplus oil hitting the market, the scenario is unavoidable. While the situation cannot and will not last, oversupply will not disappear overnight either. The Oilholic reckons it will be at least until the third quarter of 2016 before the glut shows noticeable signs of easing, mostly at the expense of non-OPEC supplies. That said, unless excess flow dips below 1 million bpd, it is doubtful ancillary influences such as geopolitical risk would come into play. For the moment, one still maintains an end-2016 Brent forecast near $60 per barrel and would revisit it in the New Year. Much will depend on the relative strength of the dollar in wake of US Federal Reserve’s interest rate hike, but Kit Juckes, Head of Forex at Societe Generale, says quite possibly commodity markets fear even a dovish Fed! Meanwhile, with the oil market rout in full swing, rating agencies are queuing up predictable downgrades and negative outlooks. Moody’s described the global commodity downturn as “exceptionally severe in its depth and breadth” and expects it to be a substantial factor driving the number of defaults higher on a global basis in 2016. Collapsing commodity prices have placed a significant strain on credit quality in the oil and gas, metals and mining sectors. These sectors have accounted for a disproportionately large 36% of Moody’s downgrades and 48% of defaults among all corporates globally so far this year. The agency anticipates continued credit deterioration and a spike in defaults in these sectors in 2016. Over the past four weeks, we’ve had Moody's downgrade several household energy companies, including all ratings for Petrobras and ratings based on the Brazilian oil giant's guarantee, covering the company's senior unsecured debt rating, to Ba3 from Ba2. Concurrently, the company's baseline credit assessment (BCA) was lowered to b3 from b2. “These rating actions reflect Petrobras' elevated refinancing risks in the face of deteriorating industry conditions that make it more difficult to raise cash through asset sales; tighter financing conditions for companies in Brazil and in the oil industry, coupled with the magnitude of eventual needs to finance debt maturities; as well as the company's negative free cash flow,” Moody’s explained. It also downgraded Schlumberger Holdings to A2; with its outlook changed to negative for Holdings and Schlumberger. "The downgrade of Schlumberger Holdings to A2 reflects the expected large increase in debt outstanding related to the adjustment of its capital structure following the Cameron acquisition," commented Pete Speer, Moody's Senior Vice President. Corporate family rating of EnQuest saw a Moody’s downgrade to B3 from B1 and probability of default ratings to B3-PD from B1-PD. Of course, it’s not just oilfield and oil companies feeling the heat; Moody’s also downgraded the senior unsecured ratings of Anglo American and its subsidiaries to Baa3 from Baa2, its short term ratings to P-3 from P-2, and so it goes in the wider commodities sphere. In the past week, outlook for Australia’s Woodside Petroleum outlook was changed to negative, while the ratings of seven Canadian and 29 US E&P companies were placed on review for downgrade. And so went the final month of the year. Not just that, the ratings agency also cut its oil price assumption for 2016, lowering Brent estimates to average $43 from $53 per barrel in 2016, and WTI to $40 from $48 per barrel. Moody’s said “continued high levels of oil production” by global producers were significantly exceeding demand growth, predicting the supply-demand equilibrium will only be reached by the end of the decade at around $63 per barrel for Brent. While, the Oilholic doesn’t quite agree that it would take until the end of the decade for supply-demand balance to be achieved, mass revisions tell you a thing or two about the mood in the market. Meanwhile, at a sovereign level, Fitch Ratings says low oil prices will continue to weigh on the sovereign credit profiles of major exporters in 2016. Of course, the level of vulnerability varies. “In the last 12 months, we have downgraded five sovereigns where oil revenues accounted for a large proportion of general government and/or current external receipts. Another three - Saudi Arabia, Nigeria, and Republic of Congo - were not downgraded but saw Outlook revisions to Negative from Stable,” the agency said in a pre-Christmas note to clients. 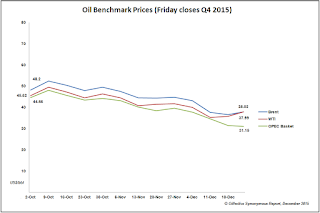 It is now all down to who can manage to stay afloat and maintain production as the oil price stays ‘lower for longer’. Non-OPEC producers will in all likelihood run into financing difficulties, as one said in an OPEC webcast on December 4, with Brent ending 2015 over 35% lower on an annualised basis. Finally, the Oilholic believes it is highly unlikely a divided OPEC will vote for a unanimous production cut even at its next meeting in June. For what’s it worth, $35 per barrel could be the norm for quite a bit of 2016. So in 12 months’ time, the oil and gas landscape could be very, very different. That’s all for 2015 folks! Keep reading, keep it ‘crude’! © Gaurav Sharma 2015. 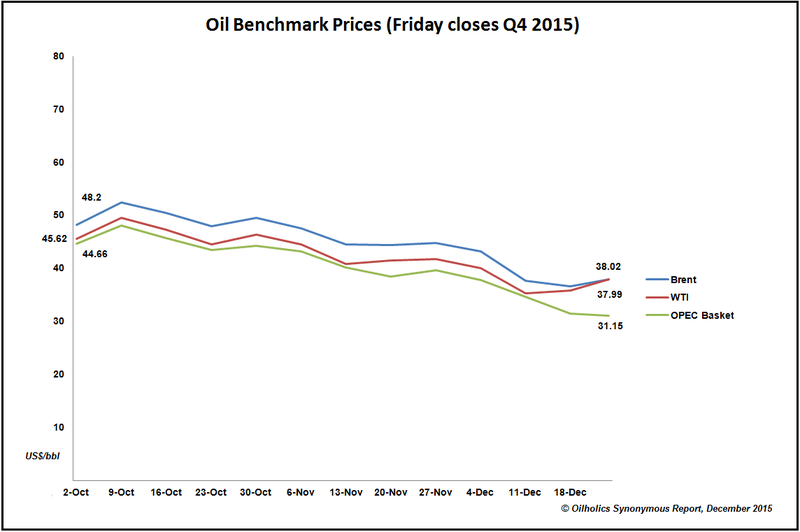 Graph: Oil benchmark Friday closes, Q4 2015 © Gaurav Sharma / Oilholics Synonymous Report, December 2015. Photo: Gaurav Sharma speaking at the 168th OPEC Ministers' Meeting in Vienna, Austria © OPEC Secretariat. Brent- WTI parity (again) before the year-end! Saudis, Iranians not budging - short baby short!